I have very sensitive oily skin. I do have a few dry spots that are prone to flaking in dry winter weather so I guess it could be considered combination. I decided to try the original mint julep masque by Queen Helene. I was happy with the feel as it wasn’t too thick and chalky like many other masques I have used. I applied it very generously to my entire face and was at first happy with the minty scent. It took about 10-15 min to fully dry. Once it is dry and you look like a million years old with dry cracked skin it’s time to wash it off. It does wash off easily however leaving a horrible sulfur smell. So I recommend washing really well with your everyday cleanser until the smell is gone. The smell isn’t bad enough that I would never use the product again but it will defiantly be one of those things I do right before getting into the shower. As a Bath & body business owner I can tell you the ingredients are very beneficial for your skin even if you don’t have troubled oily skin. 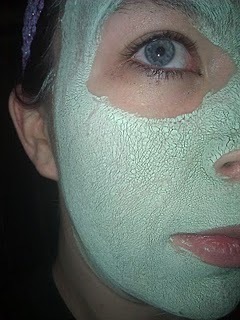 They do tighten and revitalize dull skin and it’s a nice treat. However there are unnecessary ingredients that I could have done without such as fragrance, dye, and yes the sulfur. The bentonite clay and kaolin clay are what make this product so worth it. I say overall it’s a good masque. PRO: It’s a great value at $3.99 or less for 8oz bottle. It’s available at any drug store. And it leaves your skin feeling tight, refreshed and radiant. CON: It leaves a stinky sulfur after smell, has extra ingredients that make it less natural. 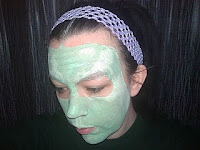 OVERALL: A good masque, comparable to many higher end products for ½ the price. Great smooth consistency.